Twin brothers Tomer and Asaf Hanuka share a similar genetic structure but were raised in different places. 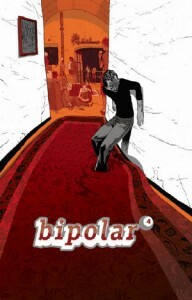 This condition creates a special tension between their stories and styles and is the foundation of Bipolar. Asaf, with writer Etgar Keret is telling the story of Pizzeria Kamikaze about a guy with a broken heart who committed suicide only to find himself at a regular day job in a world where everyone died before and now it’s about passing time. Tomer is telling personal stories with a twisted time sense that will put you right now, a year ago, and in the future. This issue in two stories: the first: Morocco — While in the rehab unit of a hospital, our hero examines his past. when it gets uncomfortable he rewrites it and keeps going to write his future as well. All on the lingering hope that it might change the present. the second: In this forth installment of “Kamikaze” our heroes discover that miracles can happen but only if they don’t matter. Mordy & Leehe help Kneller search for his talking cat but find a Trans party instead, and maybe even some true love.